Up to now Intercom has focused on making personal, relevant conversations the cornerstone of great support. But often the best route to an answer is through the customer helping themselves. It’s better for everyone: your customers get the quick, easy answers they need and your team can concentrate instead on questions that are hard to resolve. This means you’re having the right type of conversations. Everybody wins. Most support tools offer a static, monolithic knowledge base as a way to deflect customers, hoping they find the answer for themselves. These knowledge bases offer an impersonal, out of date, deliberate dead end whose sole purpose is to keep support costs down. They don’t feel like a tool for delivering world class support to customers. So when we looked at building a product for customers to get those fast, easy answers themselves, we knew there had to be a better way. Embedded content: your help content doesn’t just live in a help center, it can be shared directly in conversations with customers. Suggested articles: a layer of intelligence powered by machine learning which suggests relevant articles to share with customers. Actionable feedback: use what customers tell you to know exactly how to improve and what to write next. No dead ends: your customers always have a way to get in touch with a real person. Educate’s help center lets your customers find answers on their own, so you can spend time on problems that really need solving. Today most people think that customer self-service equals a help center. It’s the place that self-serve happens, right? But no single channel should ever dominate your approach to support. A help center disconnected from the broader support team, and the customer’s support experience, is just a neglected repository of information – sometimes helpful, often not. We’ve written and spoken before about why cards, not websites, are the future of the web; about why you should build a system, not just a static destination. That’s what we’ve done with Educate. People increasingly expect they shouldn’t have to go to a single pre-determined location to find the information they want. So why should help content live in a siloed environment? It should be capable of being automatically surfaced when and where it’s needed to help most. Content is the atomic building block of self-service support. The help center is just one vehicle for delivering that content. That’s why we put so much effort into building a content importer into Educate, so you can pull in your existing help content from Zendesk, Desk.com, Help Scout and other knowledge base products. Once you have the building blocks, you can quickly see the benefits of a systems approach. When people think of great customer support they don’t think of processes and channels, they think about experiences and outcomes. Some prefer email, some want to chat, some like to help themselves, but that’s not what makes the experience great. A great customer experience comes from being listened to and having problems solved quickly. The first problem we wanted to solve was how to insert content into the support conversations you are already having with customers. With Educate it’s easy to find, preview and insert relevant help articles directly into support conversations. Support staff can search, preview and insert content into conversations, right from the team inbox. It’s lightweight and integrated, which makes for a more efficient workflow, and one that scales. And it’s obvious to the user that it’s pre-written help content. It doesn’t awkwardly blur the line between automated and genuine replies, so customers won’t waste energy trying to figure out if they’re being spoken to in a series of canned messages. But this is only half the story. We believe there is a lot of value to applications where the power of people is augmented by machine learning. We’ve taken this approach in Educate with Smart Suggestions. As you use the product and insert more articles into conversations, you are training a suggestion engine. As it learns it will start to suggest relevant articles to be inserted into conversations, saving you even more time that you can devote to your customers’ higher touch, more challenging problems. And as with all machine learning, it gets better over time. Using machine learning help articles are intelligently recommended for you to share, based on the content of the conversation you are having with the customer. Like the products we build, it’s very hard to get content right the first time. Yet most teams approach the creation of help centers as big, one-off projects with a focus on publishing a stack of docs all at once, and then forgetting about it. The content becomes obsolete almost as soon as it’s published. Just as great product companies release small features quickly, gather feedback from users, and iterate, your help content should start small, be shipped quickly, and evolve. With Educate we’ve made it easy to get feedback. People can react to an article in a lightweight way or initiate a conversation about it if they need more help. In fact if they react unhappily to an article it automatically prompts them to give feedback or ask a question if they can’t find what they need. If a customer reacts negatively to an article they are automatically prompted to give more detailed feedback. We highlight that feedback in Educate Insights, which surfaces the next steps. Not only can you quickly see what content needs work, but with the richness of conversational feedback, you’ll know exactly what you need to do to improve it. The single source of truth becomes your users. With Educate you can easily review all feedback on an article in one place, so you can quickly update your content to address it. Many help centers feel like big libraries with all the exits locked, where you need to navigate through a labyrinth to find the actual humans. This contradicts our mission. Dead ends are bad for business. Blocking people from getting in touch succeeds only in frustrating them more, and likely means they’ll just find another way to get in touch, like with a Twitter blast. Surprisingly, what we’ve seen in user tests is that when customers know that help is there if they need it, they’re actually more confident and willing to try to find an answer on their own. 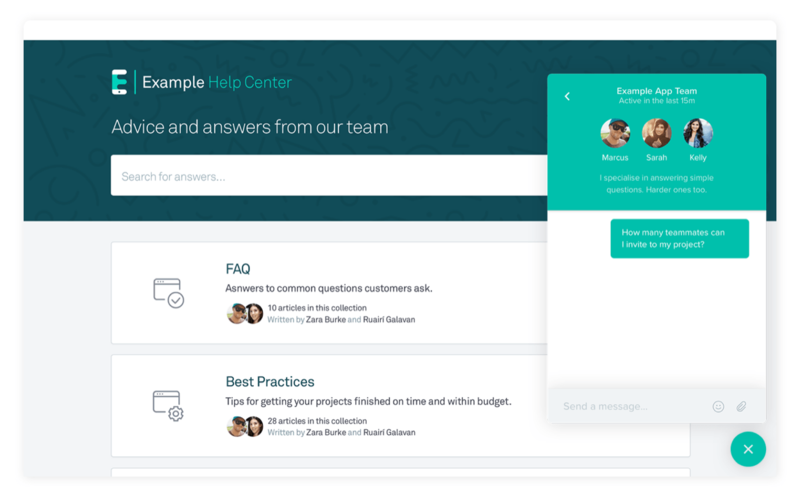 So our Messenger is visible on every page of the help center, which means customers can leave you feedback or ask for help when they can’t solve a problem on their own. Help centers aren’t history – they will continue to play a central role in customer support for many years to come. But we are moving rapidly towards a future where the help center will be just one of many ways to surface content.